Vehicle wraps are becoming more popular in today’s vehicle advertising world. People pay good money to have unique covers on their vehicles. Clients expect nothing but excellent end results as far as wrap jobs are concerned. Of course, every vehicle wrap comes with its own set of challenges. Well; some wrap jobs can be straightforward whereas others are complicated. It takes proper planning, specialized expertise, commitment, dedication, time, sweat and unique skills to tackle all wrap job affiliated obstacles effortlessly. Your vehicle wrap design can either make or break you. Getting the design right is highly recommended. Forming a stable relationship with your wrap job designer can be advantageous in so many different ways. Although you are the one paying for the services, design experts can give you sound advice or even aim you in the right direction to ensure that your vehicle wrap design is proper. An excellent vehicle wrap design has to be eye-catching, exciting, unique, and bold. It requires creativity, consultations, and teamwork to produce great vehicle wrap designs. Keeping your vehicle wrap simple can have tremendous effects on your advertisement campaign. Most people fall short of achieving the desired results entirely simply because of the wrong approach. A vehicle wrap has to be precise and unique. Unlike most print designs, vehicle wraps have to be eye-catching yet easy to understand. Putting too much advertising in your design can be distracting. Remember, reading from a fast moving vehicle can be extremely difficult for many people. A good wrap job has to be brief, memorable and easy to understand. Ensure that your vehicle wrap attracts an immediate viewer’s attention by keeping it simple. Highlighting your brand identity briefly through short messages can help you achieve great success. Also include your phone numbers, social pages, and web addresses in your advertising copy to make it easy for interested viewers to contact you. Do use bold colors and bold design. Vehicle wraps have to be colorful, dynamic, bold, sophisticated and unique to attract the intended viewers’ attention. For effectiveness purpose, consider using bright colors and designs on all your vehicle wraps. Nevertheless, desist from crowding your vehicle wraps with unnecessary design elements, graphics, and imagery. Instead, keep your wrap job simple and clear by eliminating all clutter and noisy backgrounds that may distractive to your intended audience. Your preferred colors and design should make your vehicle wrap stand out from the crowd effectively. 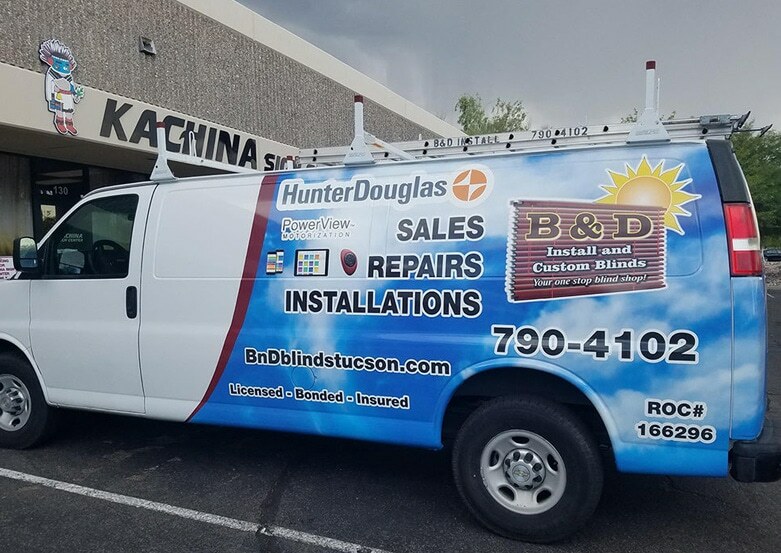 Contact Kachina Sign Center for unique, affordable and quality vehicle wraps.